The brake maintenance unit S30-60 Duo is the ideal unit for service centres carrying out more than 10 brake fluid changes per day. The unit can be easily managed by just one person which saves valuable time and money. The high flow pressure guarantees a complete flush and bleed of the hydraulic or clutch systems and thus ensures functional reliability of the brake and ABS systems. It is equipped with a pre-draining system for the car reservoir. The integrated shut-off valve allows a leakage test to be performed after repair of the brake or clutch system. 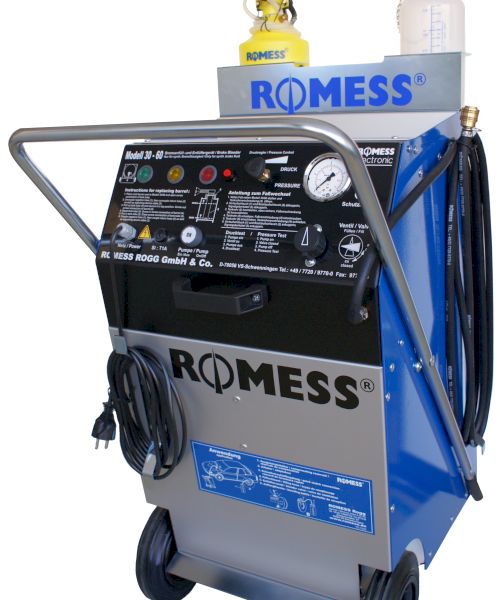 TheS 30-60/S 30-60 DUOis a solid, mobile brake maintenance device designed for using original commercial 30 - 60 liter canisters of brake fluid. The light aluminum and steel construction supported by two rubber wheels and 2 swivel castors make the device easy to transport and manage, even with a full canister. The pressure is adjustable from 0.4 to 3.5 (6 to 51 psi). The average working pressure is 1.5 to 2.5 bar (22 to 36 psi) ? refer to vehicle manufacturer for specifications. Once the process is complete and the pump is turned off, the built-up pressure escapes through the integrated recirculation system and the fluid level inside the reservoir adjusts itself accordingly. The canister is placed safely inside the integrated compartment behind the control panel and secured with an adjustable belt. The brake fluid is drawn from the canister with a tank pipe fitted for commercial canisters a with2" diameter screw caps. The unit pumps the brake fluid from the tank into the master cylinder fluid reservoir fitted with a special quick-lock adapter. When the tank reaches the minimum fluid level of 1.5 liters, the pump automatically shuts off to avoid air being inadvertently pumped into the hydraulic system. The shut-off is indicated by the red control lamp. It is not necessary to disconnect the device from the vehicle to change canisters because there is no air in the line. After changing to a full canister, the pump can be started again and the process can continue.